I have a recurring need to make splines, keyways, and other linear features, and while in some cases I could do this on my mill, using an indexing head on the bed, it’s a pain to set up and align. In many cases, the stuff I want to make, the mill can’t manage, like broaching keyways in pulleys. 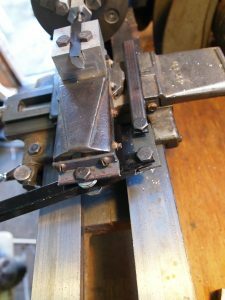 In the past, I’ve ground a custom toolbit and clamped it in the lathe toolpost and then used the carriage traverse to run it along a workpiece in the lathe spindle. This has a couple of advantages: the workpiece is automatically centered and colinear with the cutting tool, and I can cut a slot the length of the lathe bed. 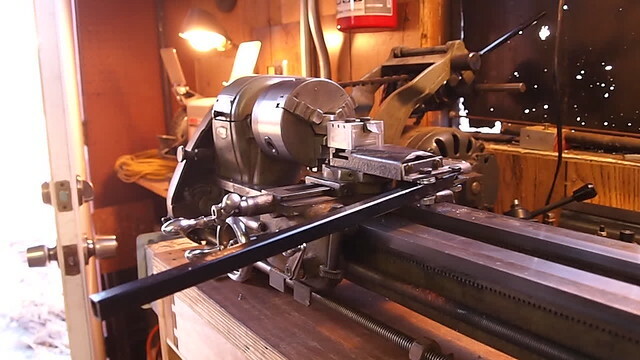 However, it’s slow and it puts a lot of strain on the carriage rack, because that’s how the carriage traverses the bed: me twirling a wheel that runs a pinion that runs on the rack, and I have to take very fine cuts in steel or risk damaging the traverse mechanism. 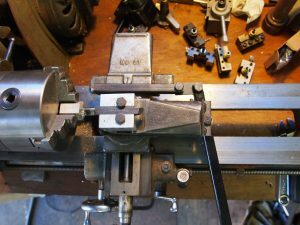 I recently made a new cross slide for my lathe, that allows me to bolt workpieces to the cross slide, and was thinking about bolting a linear way onto it to make a nice smooth shaper mechanism, but then I realized that I already have a linear way: the stock lathe compound slide. 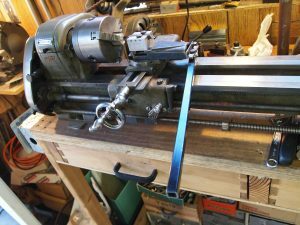 I’d seen pictures online of arm-powered shapers, using a long lever arm that the user pulls to power the shaper ram, and realized I could do the same as a bolt-on to the Atlas 618, without permanently modifying the lathe. 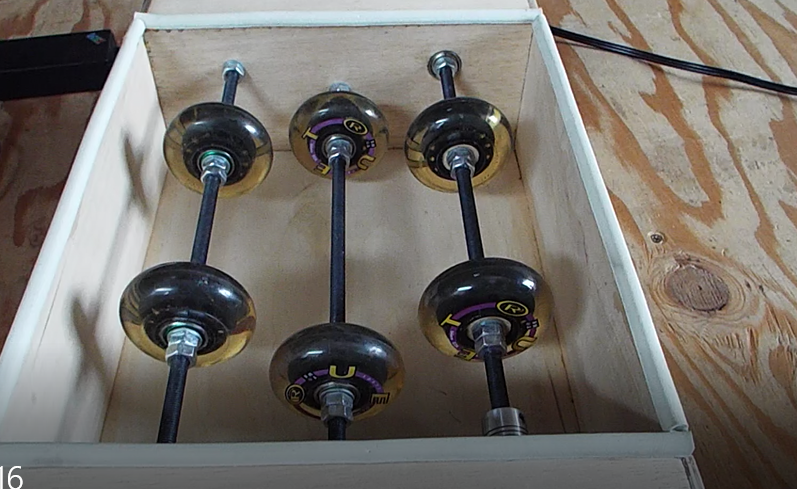 This is a really crude implementation, to see if it works. Here it is on the lathe. and a view of the idler and the compound attachment point. Here’s a video me operating it. 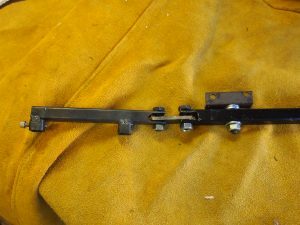 One interesting side-effect of using the compound slide is that I can set the compound slide at a slight angle (slight, because it runs into the lever arm fulcrum clamped to the cross slide body.) That means I can cut tapered splines (I’m not sure why I would ever want that) or more usefully cut square tapers. Those used to be pretty common on bicycles, for instance. Because of the geometry of the tool contact point and the lever arm contact point on the compound slide, my first attempt using a tool clamped in the quick change toolpost was unsuccessful: the leverage exerted by the tool point twisted the toolpost, and that resulted in the tool digging in even more, a feedback loop that made the whole attempt unsuccessful. Instead I milled a toolholder that mounts the tool tip directly in line with the axis of rotation of the compound slide, and now it works very well. A picture of a random demo internal spline cut in 6061-T6. 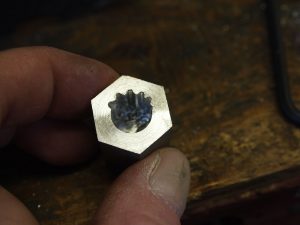 I was cutting about 0.010″ per traverse, using the Atlas 618’s locating pin and index holes on the headstock bull gear to accomplish the workpiece indexing. A better solution will be to replace the outboard headstock bearing tensioning nut with a nut that has a keyway on it (gee, I wonder how I can make a keyway?) so I can stick index plates onto it, and then clamp the headstock rotation by an arm that goes down to the threading banjo bracket. That’s next. I designed this ball mill using Inkscape. I cut it on the new Glowforge laser cutter that Mad Scientist Hut received. 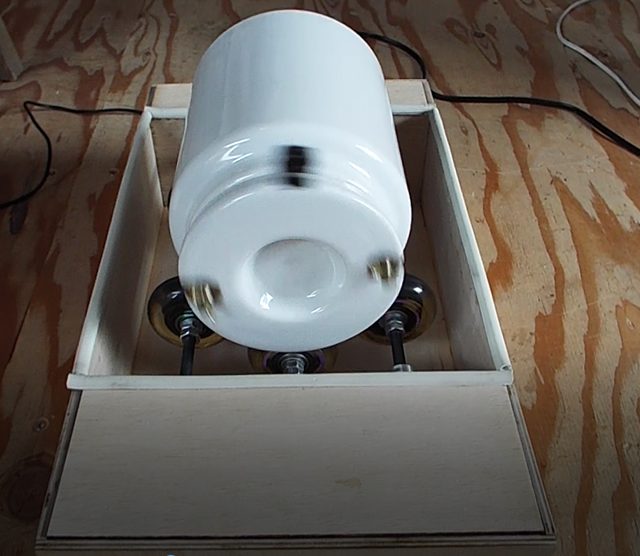 It uses a porcelain jar and ceramic balls to keep from contaminating the material being milled. If you wish to purchase more than 100, contact us for a discount.